Depending on how closely you pay attention to the OECD, you may have picked up on a subtle but meaningful change in this year’s States of Fragility report. Whereas previous reports were titled Fragile States, the Organization for Economic Cooperation and Development has shifted its framing to focus less on states and more on conditions, less on the binary status of a “fragile state” and more on fragility as a universal condition that can impede development in all countries. Fragile states are not homogenous, said Brenda Killen, deputy director of the OECD’s development cooperation directorate, during the launch of the report at the U.S. Institute of Peace. Fragility can exist in middle- and high-income countries as well as low-income countries. Associating fragility with poor and failing states, as has often been the case, makes you think the state is what needs to be fixed, said Alexandre Marc, chief technical specialist for the Fragility, Conflict, and Violence Cross Cutting Solutions Area at the World Bank. But “fixing the state is actually not an effective way of dealing with fragility,” he said. You often need to address fractures in society, traditional institutions, the private sector, and many other factors in order to build states that have the capacity, legitimacy, and authority to govern effectively. Fragility, said Marc, is when societies “want to transform” but are unable to in a non-violent way. “Fragility is not about failure…but we have this very failure-oriented approach,” in which the idea is often to stop something bad from happening, rather than support a transition towards something better. How can the 34 OECD member countries help societies transform peacefully? The report recommends changing how countries provide development assistance to fragile and conflict-affected states from a supply-driven approach to one that is demand-driven and reflects the priorities of recipients. Based on an analysis of the Harmonized List of Fragile Situations by the World Bank and Africa Development Bank and the Fund for Peace’s Fragile States Index, the report assesses five main dimensions of fragility globally, identifying the 50 most vulnerable countries in each. The five dimensions are based on the goals and targets that have emerged from the Sustainable Development Goals (SDG) negotiations: 1) peace and security; 2) access to justice for all; 3) effective and accountable institutions; 4) inclusive economic foundations; and 5) capacity to adapt to social, economic, and environmental shocks and disasters (resilience). 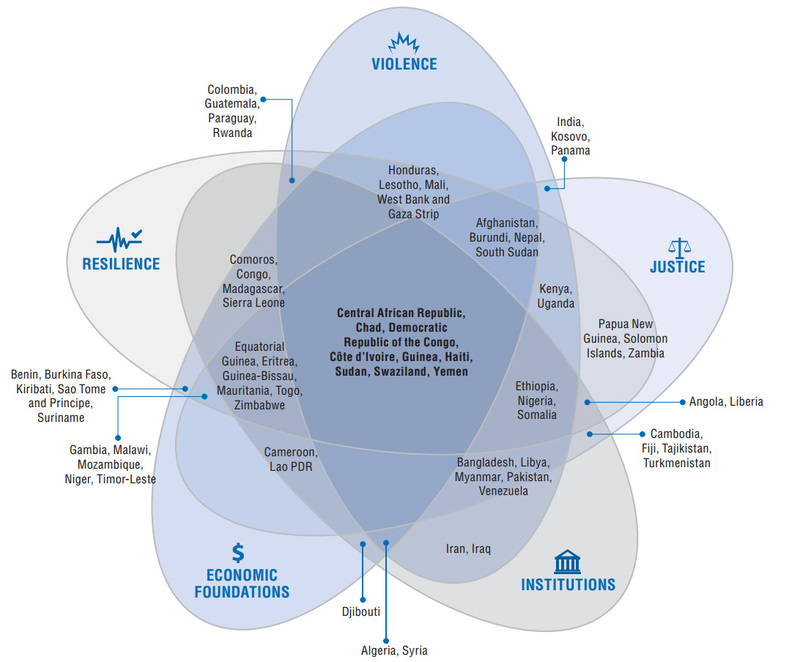 The authors use a Venn diagram to indicate which of the five dimensions of fragility the most vulnerable countries are associated with. In many ways the Millennium Development Goals, which have set the international development agenda for the last decade and a half, have been successful. However, they were not designed to take into account the context of conflict-affected or fragile states, so while extreme poverty has been halved globally, roughly two-thirds of currently fragile states are not expected to achieve this critical goal. The Sustainable Development Goals, set to be adopted later this year, are supposed to fix this. Proposed SDG 16 is, “Promote peaceful and inclusive societies for sustainable development, provide access to justice for all, and build effective, accountable, and inclusive institutions at all levels.” The SDGs are also supposed to include environmental targets and apply to all countries, not just developing, again reflecting a shift in understanding development and vulnerability. The OECD’s conception of five overlapping dimensions of fragility is a “working model,” said Profos. The measures used are proxies until the SDG framework is defined and the indicators are set, at which time the model can be run again. It’s meant as a kind of provocation, she said, to explore fragility as a multi-dimensional issue and generate responses to that framing. While official development assistance has increased to fragile states – dollars per capita has almost doubled since 2000 – it varies widely in distribution. Between 2003 and 2012, 22 percent of all official development assistance to countries on the fragile states list went to Afghanistan and Iraq. “Almost no donor takes into account the decision of other donors when they allocate their aid, and that is something that needs to change,” said Profos. Of course, it’s not just the quantity of aid that matters, but how it’s invested. The report draws on OECD data to determine to what extent the G7’s Peacebuilding and Statebuilding Goals, introduced in 2011 to kick-start how development is done in fragile and conflict-states, are reflected in the allocation of aid. The results are telling. Official development assistance (ODA) for political reform accounted for just four percent of money spent in 2012; justice, three percent; and security, just more than one percent. Overall, 46 percent of official development assistance to states in conflict or experiencing fragility was invested in activities not associated with the Peacebuilding and Statebuilding Goals, like education and the health sector. As demographer Elizabeth Leahy Madsen has noted, however, the demographic dividend, which the report cites as an opportunity for many fragile and conflict-affected states given their predominantly youthful age structures, is not possible without investments in health and education – health for fertility decline, education so young people have the skills to enter the workforce. This raises the question of how to balance priorities in conflict settings, which the OECD seems to suggest should be resolved more heavily in favor of investments in political reform, justice, and security. In addition to ODA, the report looks at foreign direct investment, remittances, and other flows of money. Remittances are responsible for providing the most external finance to countries on the fragile states list, with foreign direct investment falling in behind ODA. However, remittances are concentrated in just a few countries with large diaspora populations – over 50 percent go to Nigeria, Egypt, and Bangladesh. Only six percent of total foreign direct investment went to fragile states in 2012 and most went to just six resource-rich countries for investment in extractive industries. “This report is pushing us collectively to do more,” said Melissa Brown, director of the Office of Conflict Management and Mitigation at USAID. Reports like this and the World Bank’s 2011 Development Report, which changed the way Bank reports were authored and significantly elevated conflict prevention, are examples of how data and evidence can spark change. Because they know the magnitude of remittances to fragile and conflict-affected states, for example, the G20 is committed to lowering transfer costs, Brown said. 2015 is a pivotal year for development and peacebuilding. Besides the SDGs, the Peacebuilding and Statebuilding Goals are up for renewal and the UN is conducting a high-level review to assess progress towards implementing Resolution 1325 on equal participation of women in peacekeeping and addressing gender dynamics during operations. Sources: Foreign Policy, Fund for Peace, Organization for Economic Cooperation and Development, World Bank. 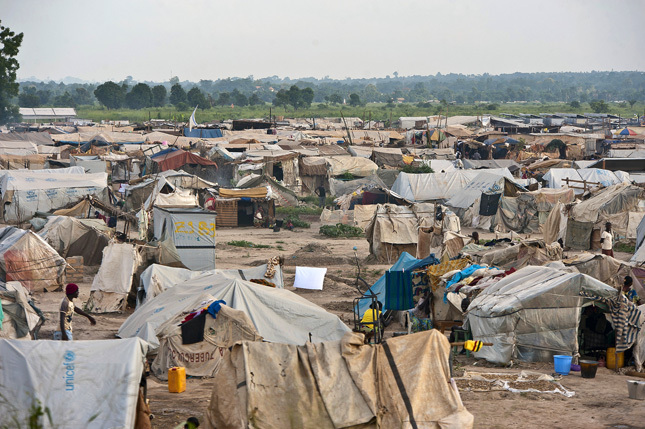 Photo Credit: Internally displaced persons camp near M’poko Airport, Bangui, Central African Republic, June 2014, courtesy of Catianne Tijerina/UN Photo.